Katharine Parr was the sixth and last wife of King Henry VIII, destined to outlive the mercurial ruler. She was already twice-widowed and childless when they wed in 1543; she was also in love with Thomas Seymour, the brother of Henry’s third queen Jane. But the king’s will was law and Katharine bowed to his demands with grace. She was an admirable wife to Henry and a loving stepmother to his two youngest children, Elizabeth and Edward. She was also the most intellectual of Henry’s wives, caught up in the turbulent religious climate of the times. And it was this passionate interest in theology which nearly ended her life, for the king was old and sickly but still capable of destroying those closest to him. Katharine saved herself and earned Henry’s respect enough to be appointed Regent of England during his military campaign in Boulogne. Upon his death in 1547, she married Seymour with indecent haste, the only one of four husbands she had chosen herself. 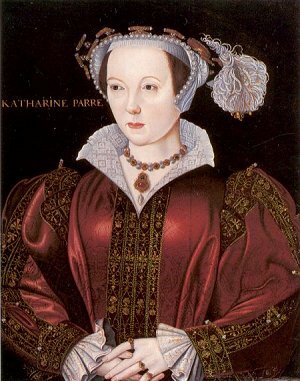 Her greatest achievement was the popularity of her devotional works; they were 16th century bestsellers and capture Katharine’s complex and abiding piety. After the debacle of his fifth marriage to a girl thirty years his junior, Henry VIII found himself in a novel position. For the first time in his tangled marital career, a future wife was not waiting to be claimed. The king turned fifty-one the year Catherine Howard was executed; he was obese, often bedridden and in great pain. His moods grew dark and vengeful. The Tudor court vacillated between the opposing factions of Catholicism and the reformed faith; they waited expectantly for Henry to choose his next wife, knowing she would tip the balance in favor of one party. But which? And was there a woman at court who would risk marrying the elderly king? The position of Queen was the greatest honor for an Englishwoman; but in the last years of Henry’s reign, it was also the most dangerous honor. After the humiliation of Catherine Howard’s infidelity, Henry was determined his next wife would not dare cuckold him. And so there was an interesting clause in the Act of Attainder which had condemned Catherine to death. It stated that ‘to avoid doubts for the future’, anyone who knew anything ‘incontinent’ about the queen must reveal it – or be condemned for treason. And if the king chose to marry a woman whom he ‘took to be a pure and clean maid’ and she turned out to be otherwise, the charge of treason would apply to both the woman and ‘all who knew it and did not reveal it’. In other words, you must speak up – either before or after the royal marriage – or die. This new law was enough to frighten even the most seasoned courtier. Before, the chance to parade a young girl before the king was a chance to make a family’s fortune; now, it was merely a chance to risk death. For who could be completely certain of a young woman’s chastity? Furthermore, who could trust the old king’s judgment on the matter? Henry had declared he ‘somewhat suspected’ the virginity of Anne of Cleves, but he had believed Catherine Howard to be a virgin when she was not. If one was relying solely upon the king’s word….. What if a chaste young woman did marry Henry and he then mistakenly declared she was ‘incontinent’? No one could impugn the word of the king, nor escape his wrath. Understandably enough, the mood at court was hesitant and frightened. And so when the king’s eye turned favorably to one Lady Latimer, thirty-one years old and twice-widowed, courtiers breathed a sigh of relief and her family could safely encourage the royal interest. After all, a widow need not prove her nebulous virginity to a credulous monarch. Katharine Parr, Lady Latimer, had many other admirable qualities which attracted the king. She has the historical reputation of a doting stepmother and devoted scholar, but she was also a woman as dedicated to finery and amusements as any of Henry’s previous wives. And though twice-widowed, she was still twenty years younger than the king. She was tall, vivacious and witty, with a kindly and sensible nature. She was the daughter of Sir Thomas Parr of Kendal and Maud Greene; Katharine was the eldest of three children, born probably in 1512, followed the next year by her brother William and a year later by her sister Anne. Thomas and Maud were courtiers during the early years of Henry VIII’s reign. Thomas was knighted at the king’s coronation in 1509 and Maud was a lady-in-waiting to his first queen, Katharine of Aragon. But Thomas died unexpectedly in 1517, and Katharine’s mother dedicated herself to securing good marriages for her children. Katharine was raised in Northamptonshire in the household of her uncle Sir William Parr. Her education was good, but not comprehensive. Later in life, she would undertake the difficult task of learning Greek and Latin; this was indicative of her genuine love and respect for scholarship, particularly with regard to women. It was Katharine Parr who encouraged Elizabeth I’s education, thus creating the most learned monarch in English history. She also made John Cheke and Roger Ascham tutors to young Prince Edward; the influence of these Cambridge ‘reformers’ upon both Elizabeth and Edward was profound. Katharine’s first marriage was in 1529; her mother died two years later. Her first husband was young Edward Borough, son of a minor lord in Lincolnshire. The marriage was childless and Edward, who had a history of lingering illness, died in 1532. Katharine’s next husband, John Neville, Lord Latimer, was forty years old, twice Katharine’s age and with a son and daughter. They wed in late spring 1533; Katharine was his third wife. Latimer was a wealthy northern landowner and Katharine quickly adapted to her new lifestyle as mistress of a large household. She also became – at the young age of twenty-one – the beloved stepmother of Latimer’s daughter. The most trying time of their marriage was the infamous Pilgrimage of Grace, which forced the conservative North against Henry VIII’s religious policies. Poor Latimer was torn between the demands of the rebels (who kidnapped him and, later, his wife and daughter) and those of his angry king. Called to London to explain himself, Latimer was eventually cleared of complicity. But his health was broken from the stress and never recovered. Katharine began to spend more time in London, nursing her husband and visiting with her younger sister Anne. Anne Parr had married William Herbert, the illegitimate grandson of the powerful earl of Pembroke, and was also a lady-in-waiting to Henry VIII’s fourth and fifth wives. Katharine was still a young woman, and this time at court opened her eyes in many ways. First, she was at last in the presence of healthy, dynamic men her own age; unlike her invalid husbands, these men were flirtatious and charming. There was never a hint of impropriety in Katharine’s actions, and she continued to nurse the ailing Lord Latimer with notable care and compassion. But she would have been less than human if she did not notice the contrast between her life in northern England and the glittering, challenging court of Henry VIII. She became increasingly interested in the theological debates of the court, but she also enjoyed its less intellectual pleasures – dancing, music, banquets, grand costumes. When she became queen, this love of clothes and jewels would be indulged on the grandest scale. While Lord Latimer lingered on his deathbed throughout 1541 and 1542, Katharine realistically assessed her future. She would soon be a very wealthy widow, finally free to make her own choices and with the youth to enjoy them. Soon enough, she had fallen in love with the charming Thomas Seymour, brother of the late Queen Jane and uncle to Henry VIII’s only male heir. But she had also caught Henry VIII’s jaded eye. His first gifts to Katharine were delivered on 16 February 1543, a year after Catherine Howard’s execution. On 2 March, her husband Lord Latimer at last passed away. Katharine looked to Seymour as her future husband, to a life of passionate fulfillment rather than one of duty. Seymour, meanwhile, took note of the king’s interest and wisely stepped back. And so Katharine Parr once again followed a dutiful course, entering into a third marriage with an older, sickly husband. But though she followed her duty, it was not an easy choice. She wrote to Seymour, ‘As truly as God is God, my mind was fully bent…. to marry you before any man I know.’ But the will of God was different than her own, she continued, and after a great spiritual struggle, she had no choice but obedience. She and Seymour parted with some promises for the future (after all, the king was ill and failing) and their feelings undiminished. The ascendancy of the Parr family had now begun. Events moved quickly. She and Henry were married by Stephen Gardiner in the ‘Queen’s closet’ at Hampton Court Palace on 12 July 1543, with all the royal children present. The marriage was an immediate success. Katharine chose as her motto ‘To be useful in all I do.’ And she had a truly endearing personality, as proven by the genuine affection which a variety of people felt for her. To the king, she was the perfect companion and nursemaid; to his children, she was a loving stepmother. As queen, she attracted those courtiers sympathetic to the reformed faith. Her rooms became famous for their theological debates, a fact which soon incensed Stephen Gardiner and other Catholics. When the king left for France on yet another expensive military campaign in July 1544, Katharine – his ‘most dearly and most entirely beloved wife’ – was made Regent of England. The only other wife accorded this honor had been Henry’s first, Katharine of Aragon. Henry returned in October to find his affairs in good order. Their marriage had its physical side as well. Though occasionally impotent, the king did consummate their marriage and Katharine was fond of ordering black satin nightdresses. She would often sit with the king’s sore leg in her lap, or in his lap herself. The king enjoyed her dancing and they both loved music; they also exchanged rich gifts. It was only when Katharine waded into the complicated morass of Tudor theology that she roused Henry’s temper. The king’s religious beliefs remain confusing centuries later; one can only sympathize with his contemporaries who had to guess at them and hope for the best. Raised a Catholic, Henry was forced to repudiate the papacy in order to marry Anne Boleyn; for several years afterwards, Protestants and Catholics alike were struck down by the king. To lean too far one way or the other risked certain death. As the king grew older, he came to appreciate the mess he had created. Where did he stand? Was he an ally of the Lutheran princes? Or did he miss the faith of his youth? It is probable that even Henry did not know the answer. But even if he didn’t know what he believed, he did know heresy when he heard it – or so he thought. Encouraged by Gardiner and other Catholic councilors, he was soon persuaded that Katharine Parr was a heretic. Katharine was coming dangerously attracted to evangelical Protestantism. Her companions were of a younger generation than the king, having grown up in the decades following Martin Luther’s triumph in Germany. Theology was no longer only the province of churchmen; the laity – and women especially – could now question and debate the most important issues for themselves. As an intelligent woman with a deep love of scholarship, this new faith appealed to Katharine. There was no room for her in Catholicism, but she could be a guiding light for the reformers. And so she was, attracting Mile Coverdale, John Parkhurst, Anthony Cope and others. She had also become close friends with Thomas Cranmer, the archbishop of Canterbury, and Catherine Willoughby, the duchess of Suffolk, another young wife of an elderly husband. Both she and Katharine used their youthful energy in defense of the new faith. Katharine Parr or Lady Jane Grey? In May 1543, the king’s council felt sufficiently alarmed by this permissive climate to pass the Act for the Advancement of the True Religion. It was directed against the ‘lower sort’ who wished to study the Bible in English, either alone or in public. It was later amended to allow noblewomen the right to read the Bible but they must do so alone and not engage in religious debate. Katharine, however, seemed content to ignore this warning. The king was openly affectionate; foreign ambassadors wrote home in praise of her kindness; her stepchildren loved her. She was secure in her position and unaware of any danger. As patroness, she favored the reformers and also sought to protect those who fell from favor. But in 1546, Baron Thomas Wriothesley was made Lord Chancellor; he was a conservative especially interested in stamping out heresy. On 24 May 1546, the reformist Anne Askew was arrested and horribly tortured. She had ties to court, particularly to the duchess of Suffolk. But she refused to implicate the queen despite repeated questioning; Wriothesley and his secretary Richard Rich were personally involved in her torture. On 16 July she was burnt at the stake for heresy. Only a few days before, the Privy Council had ordered Katharine’s estate books seized, presumably because she would soon be arrested and her property confiscated. This indicates that her Catholic enemies felt confident the king would follow their lead in disposing of his sixth wife, much as he had destroyed Thomas Cromwell four years before. And since the king possessed the disturbing quality of acting well to those he was about to destroy, his continued affection for Katharine did not worry them. Katharine, however, was still lulled into a feeling of safety. In response to Anne Askew’s execution, she hurriedly threw out her most evangelical books – but that was all. Around this time, Henry VIII was in a more irritable mood than usual. His ulcerated leg had grown worse, as had the recurrent headaches. Katharine made the mistake of engaging the king in theological discourse while he was physically unwell and under the influence of his conservative courtiers. It nearly cost her her life. Shortly after Anne Askew’s execution, the royal couple were sitting in their usual position – the king’s sore leg resting upon his wife’s lap. As she nursed him, Katharine began to lecture her husband on religion. The king was in no mood for what he considered heresy, nor to be lectured by his wife. It seemed Katharine’s enemies had won. But then the old king threw all into confusion, possibly on purpose. He told his doctor, Thomas Wendy, that Katharine was about to be arrested and soon enough an anonymous courtier dropped a copy of the warrant outside Katharine’s rooms. The queen was devastated and immediately in fear for her life. Katharine went to the king’s rooms and there he immediately began to discuss religion with her, in particular contradicting many of her reformist beliefs. Recognizing the test, Katharine agreed with it all, telling Henry that ‘women by their first creation were made subject to men’ and that ‘men out to instruct their wives, who would do all their learning from them’. The king was ‘a prince of such excellent learning and wisdom’ that she would gladly follow his counsel. But this appeal to Henry’s vanity was not enough. ‘You are become a doctor able to instruct us and not to be instructed by us,’ the king said, referring to her earlier lecture. But Katharine replied that he had ‘much mistaken the freedom she had taken to argue with him’, for she had only done it to learn from him and distract him from his illness. ‘And is it even so?’ asked Henry, with a smile. ‘Then Kate, we are friends again.’ Katharine Parr had escaped. But no one had told the king’s council. When Wriothesley and forty guards arrived to arrest Katharine the next day, the king himself beat them about the heads and shoulders, calling them foul names. Katharine was thus saved in a most public and spectacular fashion, and was soon gifted with more jewels and plate than before. Her appeal to Henry’s vanity saved her life and it also allowed the king to remind everyone who was the real master. Wriothesley had sought to recreate the destruction of Wolsey and Cromwell, using the king’s temper to destroy his personal enemies. But Henry VIII was of a mind to do otherwise. He had long lamented the loss of Cromwell and he disliked any manipulation by his councilors. By saving Katharine in such a public manner, he forced his courtiers to recognize his omnipotence and mutability. But he was not indestructible. The king’s health began a decline in the spring of 1546 from which he only sporadically recovered. By the winter, he was dangerously ill. Katharine’s own position gained new prominence since upon Henry’s death she would be the dowager queen. She already had great influence over her stepson Prince Edward. She continued to nurse Henry assiduously, but was sent away to Greenwich Palace with Mary and Elizabeth for Christmas celebrations. She returned to London on 10 January but never saw the king again. Henry VIII died in the early morning hours of 28 January 1547. After Henry’s death, Thomas Seymour’s elder brother Edward assumed the title Protector of the Kingdom, ruling in the name of his nine year old nephew. Katharine, meanwhile, married Thomas with what others (including her royal stepchildren) felt was indecent haste. The actual date is not known but Seymour referred to himself as her husband in a letter of 17 May. The wedding took place in the moonlit gardens of Chelsea Manor. Letters indicate that the ambitious Seymour pressed for a quick union. As a dowager queen, Katharine was expected to behave perfectly; also, it was theoretically possible she was pregnant by Henry VIII. For once, the always dutiful Katharine had acted impulsively. She had given up Thomas Seymour once and would not do so again. For the new king’s councilors, the marriage was a disaster. They recognized Seymour’s ambition even as Katharine fell even more deeply in love. Edward Seymour’s wife Anne Stanhope, now the duchess of Somerset, engaged in a petty battle of precedence with Katharine. Also, there were arguments over Katharine’s possessions, particularly jewelry which Henry VIII had given her. Still, there was far happier news to distract her. In late November 1547, thirty-five years old and childless through three previous marriages, Katharine Parr became pregnant. However, her pregnancy was not the happy triumph she had expected. Her husband proved too forward with the young Princess Elizabeth and Katharine was forced to send her step-daughter away. This breach hurt them both deeply. 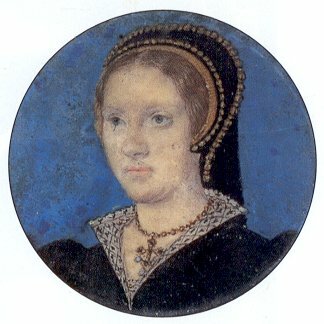 The young Lady Jane Grey remained with the household, however, for Seymour had ‘bought’ her from her ambitious parents, hoping to marry her to Prince Edward. Katharine gave birth to a girl named Mary at Sudeley Castle in Gloucestershire on 30 August. Jane Grey stood as godmother to the infant, but the happy occasion took a quick turn for the worse. Katharine Parr soon fell victim to puerperal sepsis, or ‘childbed fever’, which had also killed Queen Jane Seymour. She suffered painful delusions before sinking into calm, able to dictate her will and final wishes. She died on 5 September, and Jane Grey acted as chief mourner at the funeral. She was buried at Sudeley in St Mary’s Church. Katharine’s Parr life was always one of duty and kindness. She left behind a formidable tradition of scholarship and religious devotion, as evidenced by her own books. The great tragedy of her life was that, when finally able to marry for love, her happiness was all too brief.